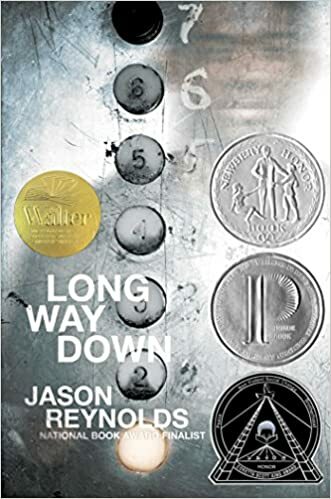 I have already admitted my book crush on Jason Reynolds, so I don't need to rhapsodize about him all over again. BUT THIS BOOK. I am a happy book, happy ending kind of person, so reading the premise for this book, I was pretty hesitant. I mean, the basic idea is a grieving brother heading out to seek revenge on his brother's death by murdering the suspected killer. Also, I tend to be a little leery of novels told in verse. Still, since it was Jason Reynolds, I decided to push through. And let me tell you, I was richly rewarded. I remember Beverly Cleary, in talking about how she came to write Henry Huggins, saying young boys came into the library she was working in and asked where the books about kids like themselves were. Cleary realized there weren't many books about regular little kids, and presto! A literary legend was born. Jason Reynolds is writing books so that urban, black teens don't need to ask where the books about them are. Will, is reeling from his brother's death only a day earlier. A seemingly random shooting that Will thinks is gang related. And if there is one thing Will knows, he knows you have to follow the rules. No crying, no snitching, and get revenge. So Will does what any self-respecting boy would do--follows the rules, grabs a gun, and heads out to get revenge. Except, on the ride down in the elevator, Will is visisted by ghosts from his past. They get on one by one at each floor of the building. As they talk to Will and share their stories, Will begins to see that maybe the rules are better off broken. As the ghosts share their stories, we see a messy, senseless culture of violence--accidental shootings of children, mistaken revenge killings, burglary gone wrong murders, and a lot of needless pain and sorrow. This book begs angry young teens to rethink the vicious cycle of violence. To put down the guns, to find a better way to solve problems, to look to their future and see a world where you don't need to be worried about being gunned down. Which is why the cover is now awash in book awards.